Evil has been unleashed upon all of the 12 realms. The darkness threatens to open the gates between all worlds, allowing evil to pass right on through and overwhelm all that is good. Heroes from all the 12 Realms – from the classic stories we’ve all heard growing up – must band together to stop this evil before it is too late! 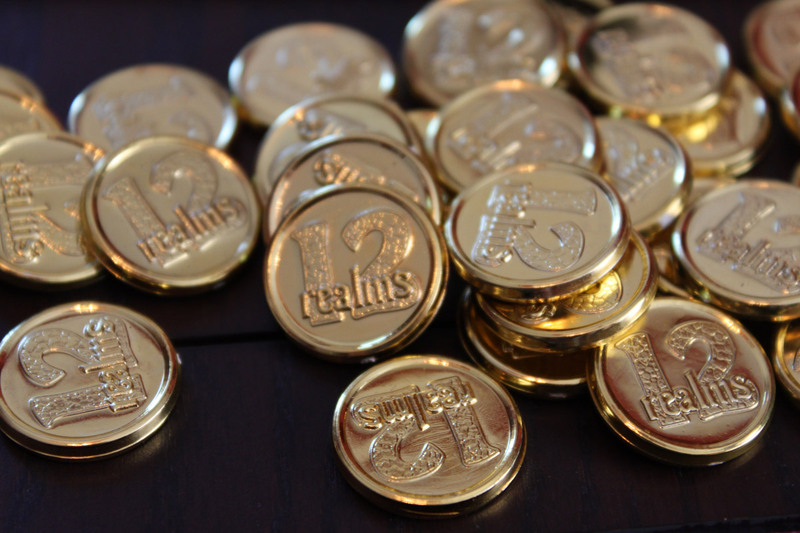 12 Realms tells the story of how the villains from across a myriad of fantasy realms decided to band together and end the battle between good and evil once and for all by flooding the realms with their minions. Players, taking on the role of heroes of those classic tales, must fend off the minions, collect Artefacts (yes, Artefacts), and use them to destroy all of the dark lords. 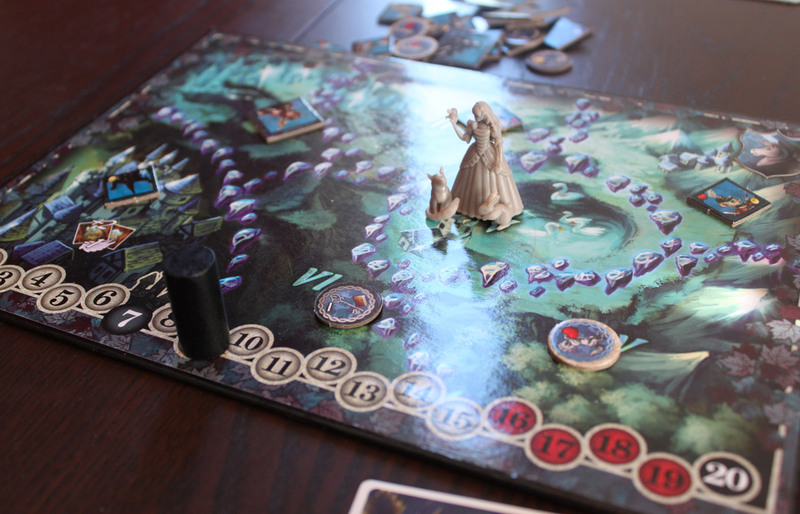 Each game uses up to 4 Realms depending on the number of players, each with its own set of Lords of Darkness, minions, artefacts, and treasure. Only 4 unique realms are included in the box; I don’t know what happened to the other 8. Maybe they got destroyed already? These are the realms. Defend them with your lives! Or at least, your Talents! An Invasion track advances based on the number of Minions in that realm. When it reaches 16, the Lord of Darkness appears, but when it hits 20 the game ends. Minions with certain special powers activate. These powers could summon addition minions or move to a different area in the realm. 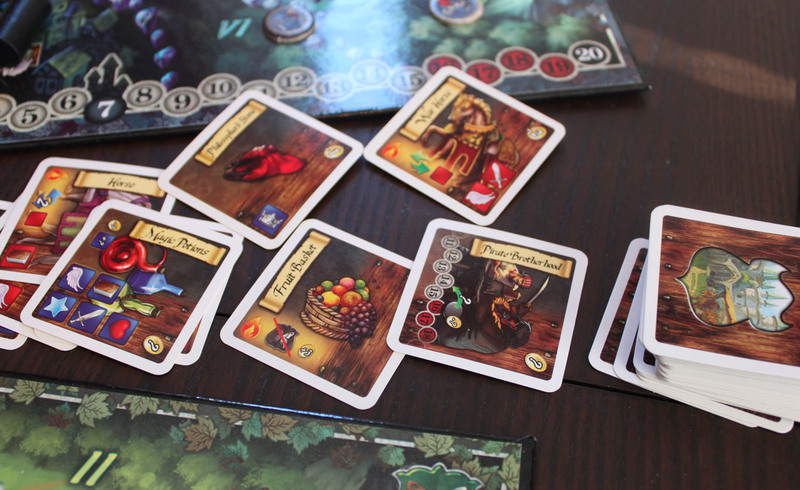 Minions, Treasure, and Artefacts are placed by drawing cards from the Realm deck and placing them in a location determined by die roll. Then, players get a chance to fight back. 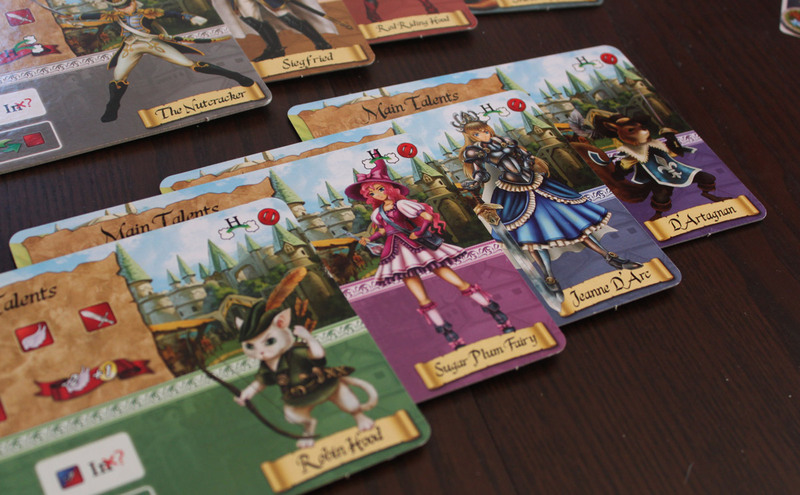 Each character has a set of “talents” which are spent to perform various actions on the board. Wings are the most common, and are used to move around a realm, or to visit the town to shop for useful items. The other talents – combat, magic, “craft”, charm, gold – are used to fight off enemies, collect treasure, and find artefacts. A player must simply spend a Talent that matches the icon on the enemy (or treasure, or artefact) token to defeat it (or claim the treasure, or discover the artefact). Items can be purchased for Gold (and gold Talents) that offer special abilities and sometimes additional Talents. At the end of each player’s turn, if they’re in a Town, they can travel to a completely different realm without spending talents. Then, at the end of the round, all spent Talents are refreshed and a new round begins. Players must collect the 3 Artefacts from each realm and use them to defeat the Dark Lord of each realm (by spending their Talents just like normal minions). When all Lords of Darkness are defeated, the players win! The concept of 12 Realms is a rather charming one; where else will you get Snow White teaming up with Robin Hood and the Sugar Plum Fairy to take on the Snow Queen and her minions? Kingdom Hearts aside, this game asks the question of classic literature that seems to have become a staple of nerd fantasy stories everywhere: what happens when worlds collide? The resulting game has some very strong elements; it also has a few flaws. And I have yet to discover how one might finish a game in 45 minutes, as advertised on the box. The good is that this cooperative game has streamlined rules that focus on managing and planning your actions and resources against increasingly overwhelming odds. It avoids the simple flaw of many highly thematic cooperative games – that is, adding challenge by removing actions and abilities from players. 12 Realms does NOT do that, and that’s a good thing. In fact, there is little element of luck during the player turns themselves; players have Talents and spend them as they choose, and succeed whenever they do. It’s simply a matter of the fact that no one has QUITE enough talents to do everything they want, or even need, to do. No player has a complete set of Talents either, so they’ll need the help of other players to conquer certain enemies or collect certain Artefact pieces. Leaving a realm unattended is pretty risky, though, so players will need to discuss plans, coordinate their movements, and do their best to stay on top of things. As I said, though, players pretty much always have a full range of actions to choose from on their turn. Talents (and number of actions) increase with collection of treasure and purchase of item cards, so you’ve got multiple short-term goals to both manage and aim for in addition to the long term goal of defeating Lords of Darkness. Actually, the item cards are a big boon to the game. Without them, the action could end up feeling pretty dry, but items add excitement and opportunity. Where the game does fall short is in pacing. The Invasion track has a tendency to halt when you’re doing well in a realm – it only advances when enemy minions are present. Early on, at least, one can keep Minions out pretty well, but that means the invasion track sits. It’s so long that it needs to advance 2-3 spaces each round in order to keep the game moving. I say “keep the game moving” because the Dark Lord’s appearance is tied to the Invasion track, so if you keep removing Minions, you’ll never get the Dark Lord out there to fight, even if you HAVE collected all the artefacts. The pacing is hurt further by wild swings in the advancement of evil. Ideally, minions would add to each realm fairly evenly, but sometimes you’ll get a significant wave of enemies on a single realm. Suddenly there will be far too many enemies to handle, and the invasion track will end up jumping 5 or 6 points. The problem with THAT is the window for killing the Lord of Darkness is pretty narrow – they appear at space 16 of the track but the game is lost at space 20. Get a minion surge at the wrong moment and you could skip right over the Dark Lord and into losing the game immediately, even if you did manage to collect all the Artefacts and keep minions manageable for the first 3/4 of the game. This is further compounded by the limitation that you can’t switch realms until the end of your turn. You can see the enemies piling up in another realm but be unable to do anything about it because you’re stuck. The tendency of the game to swing between this manageable level of enemies that drags the game to a halt and the insane minion rush that can overwhelm and quickly end a game is the biggest flaw. I would have preferred a more even way of advancing the Invasion track, or at least a different way of triggering the arrival of the Lord of Darkness in each realm. Fortunately, the item cards can be as wildly swingy in power in an equal and opposite fashion to the game’s evil advancement. Many item cards are scaled based on the number of minions; in one game I played with my wife, she had a HUGE minion rush in her realm. She got an item that let her gain a gold coin for each Minion in her current realm,which landed her about 17 gold coins in one go. She utilized that money to bribe a few enemies to leave, preventing an immediate loss, and in the next round, used the gold to purchase an item card that wiped out every Minion in a single realm. So, despite the fact that player turns are barely random at all, and that planning and cooperation are central, there are great swings of luck. Savvy players will make sure to utilize those powerful item cards at key moments to bring victory. That leaves us with just a few things left to discuss. The components of this game are, much like the gameplay itself, overall pretty good, but with a few flaws. The art is vibrant and colorful, and in a sort of anime-ish style. Card stock is good, plastic minis are detailed, gold coins are shiny. Some might question the art direction, because for some reason Robin Hood is a cat and D’artagnan is a fox, while the rest of the heroes are quite human. Minions are drawn from a range of classic storybook villains, with recognizable and obscure mythical creatures alike with a few bonus humanoid-animal people thrown in. I really don’t know where these things come from. The biggest component disappointment is the minis, which as I said are detailed quite nicely… but they lack bases, and most of them are unable to stand, which makes them look silly. Only Snow White, who is blessed with a wide floor-length skirt can balance easily. I’ve heard that the upcoming second printing of the game has fixed this issue. 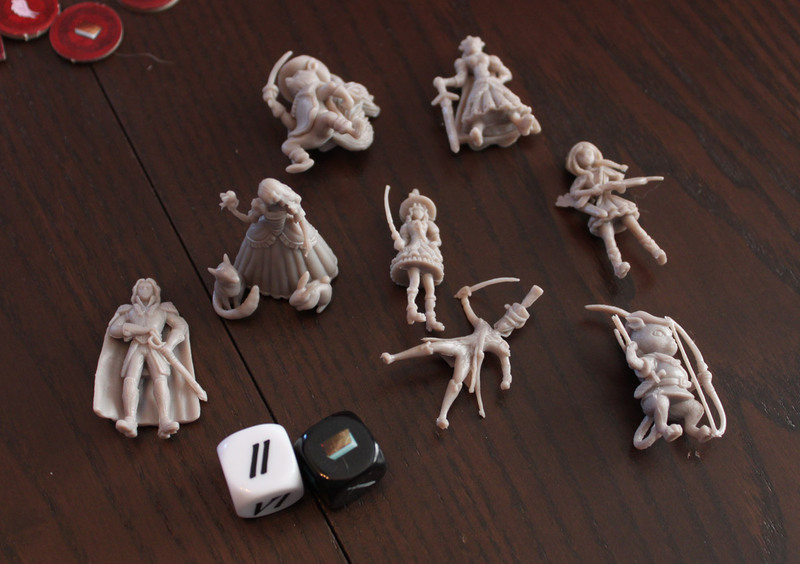 *Edit: I was informed by the publisher that the minis should in fact have bases included, even in the first printing. Apparently they were just missing from my copy, and the publisher willingly provided the missing pieces. Retail copies should have bases and if they do not, you can contact the publisher for replacements. Ashes, ashes, we all fall down! SNOW WHITE, AGAIN? The rulebook is okay, not great, but there is a detailed system of icons that is very, very confusing. The “talent” icons work fine, but the item and minion cards used a system of icon combinations that quickly becomes unreadable. It doesn’t help that certain icons look the same – the “summon” minion power, which brings a new minion at the start of the round, and “horde” which brings in a slew of extra minions at the time of placement, both feature an icon of the minion with a number, formatted the exact same way – the only difference is “summon” is always +1 and “horde” is never +1. It’s a little confusing, and even more so with Minion icons not being listed on the back of the rulebook like the rest of the icons. Item cards aren’t much better, and often consist of a string of icons that I ALWAYS have to look up in the rulebook to double check and make sure. Publishers take note: icons are nice. But if you have to look them up every time, they’re useless. Consider pairing icons with a text description. Okay, enough complaining out of me. It is worth mentioning, the game includes a few additional rules variants to add variety to your games. The Black Fortress(es) add some difficulty, special town tokens add new places to purchase special cards, alternate Item cards can be used, and one player can play as THE Dark Lord. There are a few variants in the rules whose tokens are not included in the box, so you’ve got some mini-expansions to look out for if you enjoy the base game and thirst for more. 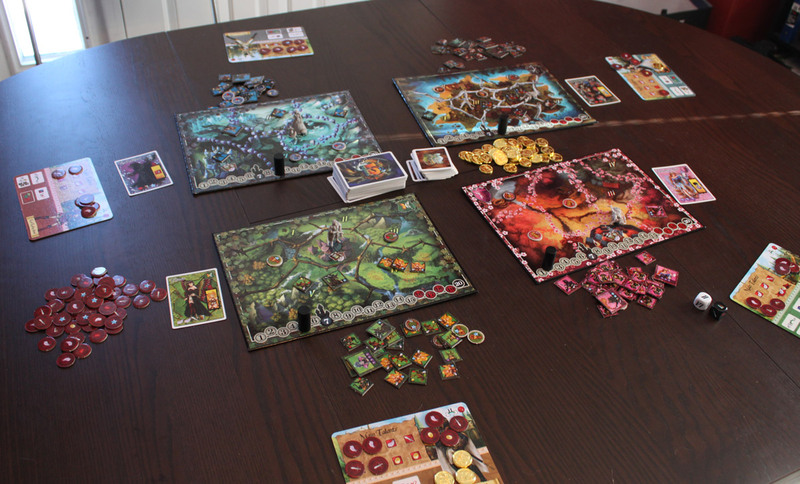 Overall, 12 Realms is a charming storybook adventure that provides some thematic fun and a bit of cooperative challenge. The rules are easy to teach, even though you better keep the book on hand for icon reference, and although the pacing is off, there’s definitely a fun game here. 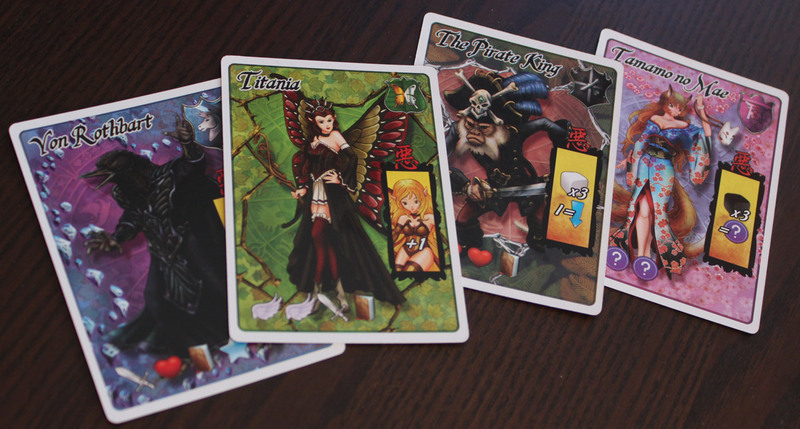 If you’ve ever wanted to team up the Hoods, Robin and Red Riding, or see how Snow White would fair against the Pirate King, or find out who Siegfried is… this game could be for you. Play as your favorite storybook heroes! Next Article Review: Going, Going, GONE! Thanks so much for this review! 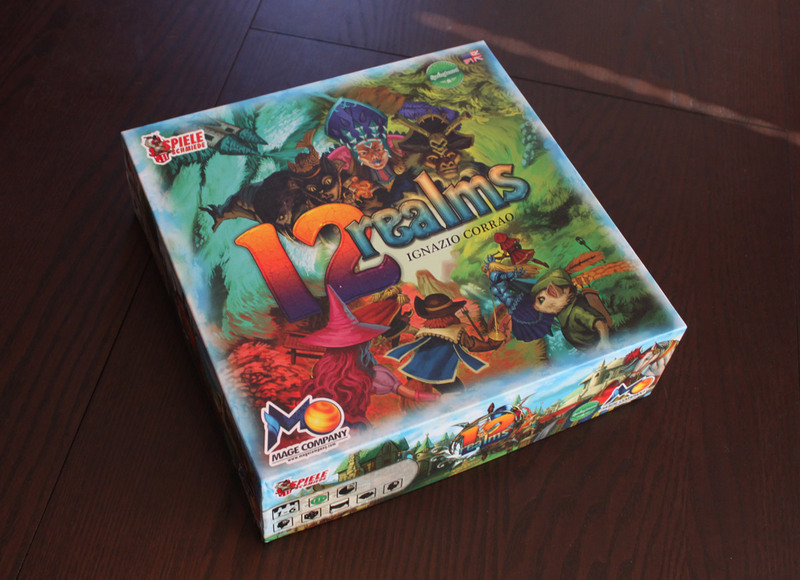 12 realms is a game that I have had my eye on for some time and have been very intrigued by it. The idea behind the game is very interesting to me. The main thing keeping me away was the coop nature as I am generally not a fan of coops. In many coops (say Pandemic as my best example) it feels like you are not even needed as your friends make your decisions for you before you have a chance to think for yourself. Is there an element of that in 12 realms?